La source de cet article est la revue anglo-chinoise sur internet China Dialog. Tom Copsey est l'animateur du site climate nexus. L'article a été écrit, semble-il, directement pour China Dialog. Nous avons voulu faire connaitre au public français le pillage organisé par l'administration Trump de l'agence américaine pour l'environnement. Nous nous excusons de ne pas avoir eu le temps de traduire. The Trump Administration has been marked by scandal after scandal. Controversies involving corruption, potential collusion with the Russian government, and hush-money paid to adult film actresses, have dominated news here in the United States. 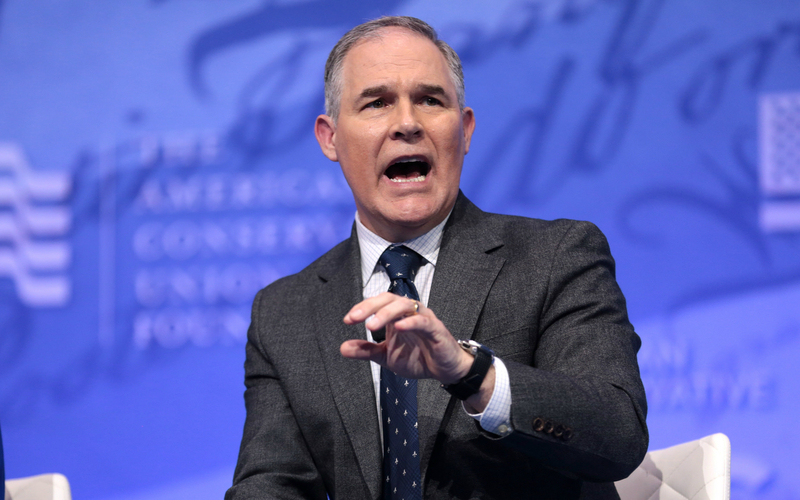 Despite these salacious stories, Scott Pruitt, Administrator of the Environmental Protection Agency (EPA), has still managed to make headlines of his own. Now facing 12 separate investigations, it would seem a matter of time before he resigns or hears his boss’ famous catchphrase, “you’re fired”. But President Trump and other Republican politicians are sticking with the embattled Pruitt. So why is he in trouble, what does it mean for climate change and the environment, and what’s likely to happen next? While Pruitt has been keen to reduce the amount of money spent on environmental protection, he’s been less careful with his own spending, repeatedly billing the government for first-class travel, significantly increasing the size of his security detail on his first day as Administrator, and building a US$43,000 (274,000 yuan) secret phone booth as part of a concerted effort to avoid scrutiny and oversight of his behaviour. The reasons for this obsession with secrecy and security have become clearer after a series of freedom of information requests made by journalists and environmental groups. One of the more serious charges facing Pruitt is that he had inappropriate dealings with lobbyists for fossil fuel companies. These include renting a home owned by the wife of a lobbyist whose clients included major oil and gas companies, at below market rates. One of the more serious charges facing Pruitt is that he had inappropriate dealings with lobbyists for fossil fuel companies. Another lobbyist helped organise a trip for Pruitt to Morocco. During the trip Pruitt spent time promoting US liquefied natural gas, a highly unusual topic for the Administrator of the EPA. Months after helping plan the trip the lobbyist, Richard Smotkin, was hired by the government of Morocco as a US$40,000-a-month foreign agent. Such behaviour by an EPA Administrator is odd, but it’s not unprecedented for Scott Pruitt. When he was a state senator in Oklahoma, he bought a home with yet another registered lobbyist, while also advancing their causes in the state legislature. He also kept secret a meeting he had with Cardinal George Pell, a noted Australian climate change sceptic. Cardinal Pell is under investigation for sexual abuse of minors. Unsurprisingly, given his choice of dining companions, Pruitt is no great fan of science. He has attempted to limit the use of scientific studies in crafting legislation, while appointing noted climate change sceptics to key positions and ousting more qualified scientific advisors. More recent scandals even have a Chinese connection. Acting against the guidance of EPA staff, Pruitt exempted Foxconn from federal air quality regulations despite evidence that smog levels in south-eastern Wisconsin, where Foxconn plans to build a new manufacturing facility, were already above federal standards. President Trump attended an announcement of Foxconn’s plans, and Pruitt’s actions are also seen as benefiting Wisconsin’s Republican Governor Scott Walker who is facing a difficult election campaign. Although Pruitt has been working to advance industry interests, his support has proved a mixed blessing. The Alliance of Automobile Manufacturers, which had lobbied aggressively to cut fuel-economy standards, is now worried that auto manufacturers are facing a “regulatory nightmare” as the EPA and other agencies have gone further than anticipated, creating new legal fights with California and at least 12 other states. The move could result in different standards for different parts of the country, cutting industry profits. How has Pruitt survived so long? Under any other president, the steady flow of scandal would have ended his service. But Pruitt has made a lot of noise about how he is implementing Trump’s pro-fossil fuel, anti-government agenda, although many of his efforts to slash environmental regulations have subsequently been slowed by more legal challenges. Under any other president, the steady flow of scandal would have ended his service. His efforts have endeared him to President Trump and his voter base. Trump has dismissed some of the scandals as the product of an overzealous media and disgruntled environmental groups. A few congressional Republicans have now joined their Democratic colleagues in calling for Pruitt to resign, but for the most part they have stayed quiet. Another explanation is that Trump has little to gain by firing Pruitt now. His deputy, Andrew Wheeler, is a former coal industry lobbyist, who also worked for Senator Jim Inhofe, another climate change sceptic. Wheeler is seen by insiders as having a similar agenda to Pruitt, but more Washington nous, and fewer scandals. If Pruitt manages to keep his job until the beginning of June, President Trump may be able to keep Wheeler as acting EPA Administrator without Senate confirmation until as late as March 2020. By contrast, more immediate action would mean a difficult congressional confirmation hearing for Pruitt’s replacement. The recent, high profile resignations of three of Pruitt’s closest aides at the EPA may be a sign of a coming change. Whatever happens next, it’s unlikely to be great news for the environment.